Spending a week in New York is a great way to see a lot of art. There’s all the stuff you expect to see of course – great exhibitions at MoMA, the Met, the Guggenheim etc – and there are the big name commercial galleries that are always worth a visit and then there are the galleries you just wander into because something catches your eye. By the end of this visit, I felt – as usual, I suppose – that there was so much I’d wanted to see but hadn’t managed to get to. I could happily spend a week wandering round Chelsea and probably the same again elsewhere. Aware of how little I’d seen I snuck a last quick visit to Chelsea into my final morning, in the main wandeing at random, and just as I really needed to start thinking about getting back to the hostel – oh, this glamorous life! – I spotted Alan Rath’s work in Bryce Wolkowitz and had to take a look. It was Yes, Yes, Yes! that pulled me into the gallery. It did so by being beautiful and bizarre. The feathers gently billowing (can feathers billow? Maybe not, but that’s the best description I can come up with) for no apparent reason have a slightly crazy, snakelike look. Further into the space there are a series of screen-based works. 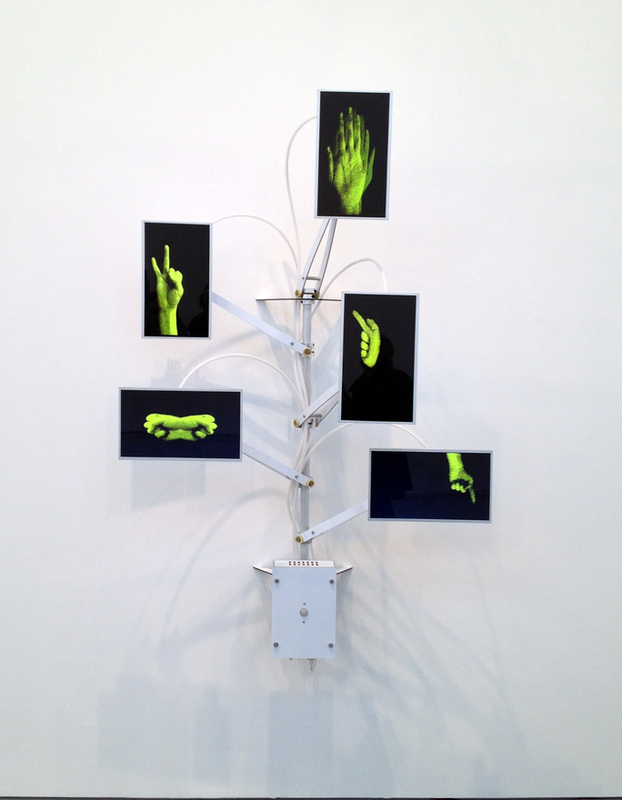 Each is a multi-screen piece with fragments of the body creating sign systems. 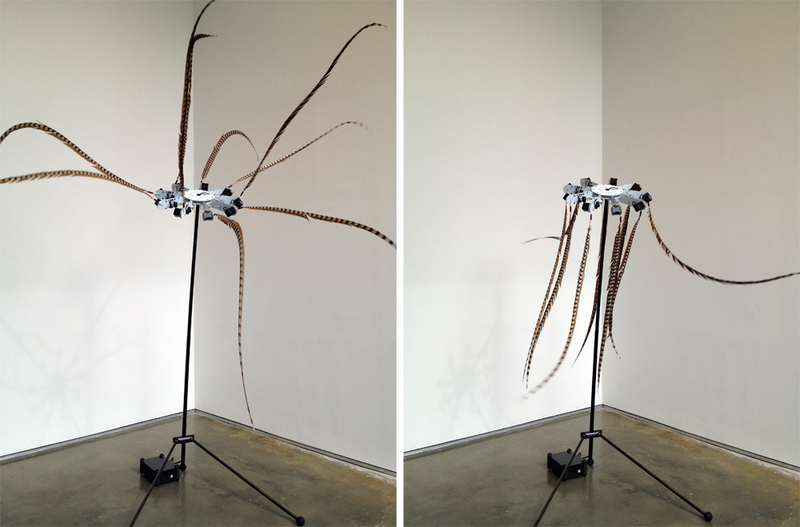 The images are human but the forms of the sculptures are determined by the technology on which these are displayed, so digital forms are used to embody human fragments. In 6 O’Clock this takes the form of hands with gestures and signs seeming to count and point. Is the work trying to direct us or communicate with us and engage us in a dialogue? 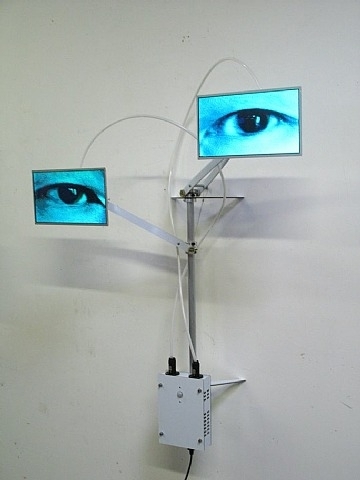 Other works, like Watcher VII, include eyes, watching us looking at them, creating an interplay between viewer and work in which the sculpture seems to respond to its observers. 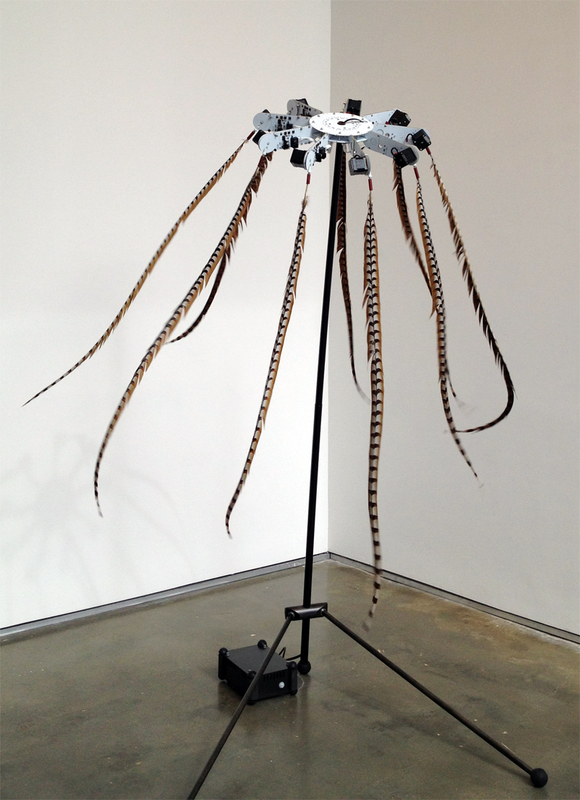 This entry was posted in Film/Video, Sculpture, Technology and tagged 6 o'clock, Alan Rath, art, Bryce Wolkowitz, sculpture, Watcher VII, Yes Yes Yes! by Ann Jones. Bookmark the permalink.